Variety: What’s lacking in Up in Smoke is a cohesiveness in both humor and characterization. Once the more obvious drug jokes are exhausted, director Lou Adler lets the film degenerate into a mixture of fitful slapstick and toilet humor. Slant: Still, most of the movie’s charm resides with the two comedians, and Adler’s best directorial choices are the simple two-shots that allow Chong’s lighting of a taco-sized joint and Cheech’s “hija de la chingada!” double take to naturally bounce off each other. If Up in Smoke lacks the energy of 1978’s other influential, anti-establishment hit, Animal House, it makes up by rejecting the all-white fraternity superiority of John Landis’s comedy in favor of Cheech and Chong’s pluralizing search for far-out pleasure. 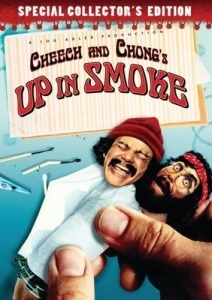 How Did ‘Cheech and Chong’s Up in Smoke’ Change the Movies? So what, exactly, is a lid? Sorry, it's an 1/8 of an ounce. Some people on the internet seem to be saying it's an ounce, but that sounds like nonsense to me. "Hey, have fun at Magic Mountains." Also, The Whores got robbed in the Rock Fight. Here's the full version recorded in April of '77 when the band was still called Village. Nah, a lid's an ounce.